Virtual reality-based training has found increasing use in neurorehabilitation to improve upper limb training and facilitate motor recovery. The aim of this study was to directly compare virtual reality-based training with conventional therapy. In a multi-center, parallel-group randomized controlled trial, patients at least 6 months after stroke onset were allocated either to an experimental group (virtual reality-based training) or a control group receiving conventional therapy (16×45 minutes within 4 weeks). The virtual reality-based training system replicated patients´ upper limb movements in real-time to manipulate virtual objects. Blinded assessors tested patients twice before, once during, and twice after the intervention up to 2-month follow-up for dexterity (primary outcome: Box and Block Test), bimanual upper limb function (Chedoke-McMaster Arm and Hand Activity Inventory), and subjective perceived changes (Stroke Impact Scale). 54 eligible patients (70 screened) participated (15 females, mean age 61.3 years, range 20–81 years, time since stroke 3.0±SD 3 years). 22 patients were allocated to the experimental group and 32 to the control group (3 drop-outs). Patients in the experimental and control group improved: Box and Block Test mean 21.5±SD 16 baseline to mean 24.1±SD 17 follow-up; Chedoke-McMaster Arm and Hand Activity Inventory mean 66.0±SD 21 baseline to mean 70.2±SD 19 follow-up. An intention-to-treat analysis found no between-group differences. Patients in the experimental and control group showed similar effects, with most improvements occurring in the first two weeks and persisting until the end of the two-month follow-up period. The study population had moderate to severely impaired motor function at entry (Box and Block Test mean 21.5±SD 16). Patients, who were less impaired (Box and Block Test range 18 to 72) showed higher improvements in favor of the experimental group. This result could suggest that virtual reality-based training might be more applicable for such patients than for more severely impaired patients. Virtual reality-based rehabilitation systems are gaining popularity because of their ease of use, applicability to wide range of patients, and ability to provide patient-personalized training [1–3]. Additional reported benefits of virtual reality systems for both patients and health providers include increased therapy efficiency and a high level of attention in patients during training . One of the main struggles therapists encounter is keeping patients motivated throughout conventional training sessions. The Yerkes-Dodson Law describes the relationship between arousal or motivation and performance . At first, an increase in arousal and motivation leads to an increase in performance. But once a certain point is reached, this point can vary based on many factors including the task, the participant, and the context, the relationship becomes inverse and increases in arousal caused decreases in performance. In line with these ideas, previous research has shown that increased performance leads to greater improvement in patients after stroke up to a certain point. Virtual reality-based systems allow manipulation of arousal through training settings to ensure that peak performance is maintained for as large a portion of the therapy time as possible . Laver et al. systematically evaluated the literature regarding the efficacy of virtual reality-based training in stroke rehabilitation in 2011 and in its updates in 2015 and 2017 [3, 7, 8]. Their current meta-analysis of 22 trials including 1038 patients after stroke that focused on upper limb function did not reveal a statistically significant difference between VR-based training and conventional therapy (0.07 standard deviation higher in virtual reality-based compared to conventional therapy. Furthermore, the authors rated the quality of evidence as low, based on the GRADE system. However, for ADL function the experimental groups showed a 0.25 higher standard deviation than the conventional therapy groups based on ten studies, including 466 patients after a stroke with moderate quality of evidence. Only 10% of the included studies included more than 50 participants, with mean ages between 46 to 76 years. However, due to the different systems used no conclusion could be drawn regarding grip strength, dosage, type or program of the virtual reality-based training. Furthermore, the authors pointed out the low sample sizes and the low methodological quality of the reported trials. In their recommendations for further research, the authors encouraged researchers and clinicians again to conduct larger trials and to increase the detail in reporting to enable more firm conclusions. YouGrabber (now renamed Bi-Manu Trainer), a game-based virtual reality system designed for upper-limb rehabilitation, has been shown to be effective in children with cerebral palsy. A 2-subject feasibility study indicated that the findings might extend to chronic stroke patients [9, 10]. Both male subjects, who were trained three years after insult onset, showed increases in scores for the bimanual activities of daily living focused Chedoke McMaster Arm and Hand Activity Inventory (CAHAI) that persisted at the final follow-up, and corresponding cortical changes measured with fMRI. Based on these findings the present multicenter parallel group randomized single-blinded trial aimed to investigate the efficacy of a virtual reality-based training with the YouGrabber training device (now renamed Bi-Manu Trainer) compared to conventional therapy. The study was designed to test the hypothesis that patients in the chronic stage after stroke in the virtual reality-based training group will show no higher post-intervention performance in the Box and Block Test (BBT) compared to patients receiving an equal training time of physiotherapy or occupational therapy. For comparison with published and ongoing international studies we selected the Box and Block Test as the primary outcome measure and the CAHAI as the secondary outcome measure. This prospective, multicenter, single-blinded, parallel-group randomized trial was conducted in the outpatient departments of three rehabilitation hospitals in the German and French speaking parts of Switzerland: University hospital Inselspital Bern, Buergerspital Solothurn, and Reha Rheinfelden. In the study plan, each hospital was responsible for the recruitment, assessment, and therapy of 20 patients: 10 patients for the experimental group (EG) and 10 for the control group (CG), respectively. More details regarding the study methodology can be found in the study flow chart in Fig 1 and the previously published study protocol strictly followed by each center (http://trialsjournal.biomedcentral.com/articles/10.1186/1745-6215-15-350) . Ethics approval was warranted by the ethics committee of the Canton Aargau (2012/065) and the Canton Berne (220/12). The study was registered with ClinicalTrials.gov: NCT01774669 before the start of patient recruitment. Patient flow chart.BS = Buergerspital Solothurn, IS = Inselspital Bern, Reha Rheinfelden Measurement sessions: twice within one to two weeks before intervention start (BL, T0), once after eight (T1) and after 16 (T2) intervention sessions, and after a two months follow-up period (FU). To explore the patterns of cognitive and motor recovery at four time points from admission to nine months post-discharge from IR and to investigate the association of therapeutic factors and pre- and post-discharge conditions with long-term outcomes. Secondary analysis of traumatic brain injury-practice based evidence (TBI-PBE) dataset. Inpatient rehabilitation (IR) in Ontario, Canada. A total of 85 patients with TBI consecutively admitted for IR between 2008 and 2011 and had data available from admission to nine months follow-up. Functional Independence Measure-Rasch cognitive and motor scores at admission, discharge, three, and nine months post-discharge. Cognitive and motor recovery showed similar patterns of improvement with recovery up to three months but no significant change from three to nine months. Having fewer post-discharge health conditions was associated with better long-term cognitive scores (95% CI -13.06, -1.2) and added 9.9 % to the explanatory power of the model. More therapy time in complex occupational therapy activities (95% CI .02, .09) and fewer post-discharge health conditions (95% CI -19.5, -3.8) were significant predictors of better long-term motor function and added 14.3% and 7.2% to the explanatory power of the model, respectively. Results of this study inform health care providers about the influence of the timing of IR on cognitive and motor recovery. In addition, it underlines the importance of making patients and families aware of residual health conditions following discharge from IR. Neurological impairments such as stroke cause damage to the functional mobility of survivors and affect their ability to perform activities of daily living. Recently, robotic treatment for upper limb stroke rehabilitation has received significant attention because it can provide high-intensity and repetitive movement therapy. In this review, the current status of upper limb rehabilitation robots is explored. Firstly, an overview of mechanical design of robotics for upper-limb rehabilitation and clinical effects of part robots are provided. Then, the comparisons of human-machine interactions, control strategies, driving modes, and training modes are described. Finally, the development and the possible future directions of the upper limb rehabilitation robot are discussed. Stroke is one of the leading causes for disability. In China, there are more than 2 million new cases every year. More than 1.5 million people die from stroke each year, and three quarters of the survivors have varying degrees of sequelae . The weakness and loss of the control of the upper limb that arise from nerve damage are the main symptoms . This disease not only brings pain and heavy financial burden to patients and families but also brings huge economic losses and some social problems to the country. With the development of robot technology, the application of robot in rehabilitation has aroused wide concern in the international community. A series of intelligent rehabilitation robots including artificial prosthesis and external mechanical auxiliary system have successfully developed to help patients to achieve functional recovery or compensation for the loss of motor function [3–5]. There are two types of rehabilitation robot for upper extremity: one is end-effector upper limb rehabilitation robots, another is exoskeleton rehabilitation robot . These robots can provide rehabilitation training tasks used to guide the patients to complete targeted rehabilitation training (Figure 1). At the same time, the provision of repetitive and intensive physical therapy greatly reduces the burden of physical therapists [7–10]. Transcranial direct current stimulation (tDCS) is an effective neuromodulation adjunct to repetitive motor training in promoting motor recovery post-stroke. Finger tracking training is motor training whereby people with stroke use the impaired index finger to trace waveform-shaped lines on a monitor. 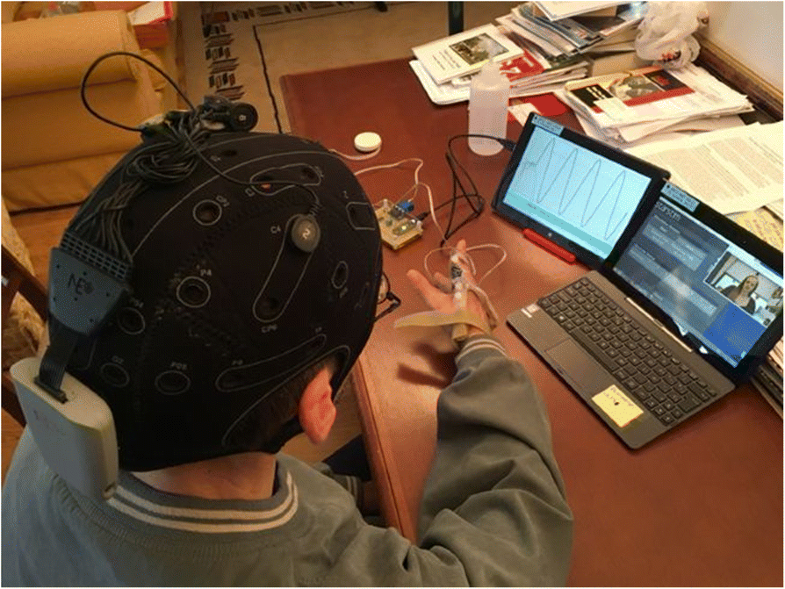 Our aims were to assess the feasibility and safety of a telerehabilitation program consisting of tDCS and finger tracking training through questionnaires on ease of use, adverse symptoms, and quantitative assessments of motor function and cognition. We believe this telerehabilitation program will be safe and feasible, and may reduce patient and clinic costs. Six participants with hemiplegia post-stroke [mean (SD) age was 61 (10) years; 3 women; mean (SD) time post-stroke was 5.5 (6.5) years] received five 20-min tDCS sessions and finger tracking training provided through telecommunication. Safety measurements included the Digit Span Forward Test for memory, a survey of symptoms, and the Box and Block test for motor function. We assessed feasibility by adherence to treatment and by a questionnaire on ease of equipment use. We reported descriptive statistics on all outcome measures. Participants completed all treatment sessions with no adverse events. Also, 83.33% of participants found the set-up easy, and all were comfortable with the devices. There was 100% adherence to the sessions and all recommended telerehabilitation. tDCS with finger tracking training delivered through telerehabilitation was safe, feasible, and has the potential to be a cost-effective home-based therapy for post-stroke motor rehabilitation. Post-stroke motor function deficits stem not only from neurons killed by the stroke, but also from down-regulated excitability in surviving neurons remote from the infarct . This down-regulation results from deafferentation , exaggerated interhemispheric inhibition , and learned non-use . Current evidence suggests that post-stroke motor rehabilitation therapies should encourage upregulating neurons and should target neuroplasticity through intensive repetitive motor practice [5, 6]. Previously, our group has examined the feasibility and efficacy of a custom finger tracking training program as a way of providing people with stroke with an engaging repetitive motor practice [7, 8, 9]. In this program, the impaired index finger is attached to an electro-goniometer, and participants repeatedly move the finger up and down to follow a target line that is drawn on the display screen. In successive runs, the shape, frequency and amplitude of target line is varied, which forces the participant to focus on the tracking task. In one study, we demonstrated a 23% improvement in hand function (as measured by the Box and Block test; minimal detectable change is 18% ) after participants with stroke completed the tracking training program . While our study did not evaluate changes in activity in daily life (ADL) or quality of life (because efficacy of the treatment was not the study objective), the Box and Block test is moderately correlated (r = 0.52) to activities in daily life and quality of life (r = 0.59) . In addition, using fMRI, we showed that training resulted in an activation transition from ipsilateral to contralateral cortical activation in the supplementary motor area, primary motor and sensory areas, and the premotor cortex . Recently, others have shown that anodal transcranial direct current stimulation (tDCS) can boost the beneficial effects of motor rehabilitation, with the boost lasting for at least 3 months post-training . Also, bihemispheric tDCS stimulation (anodal stimulation to excite the ipsilateral side and cathodal stimulation to downregulate the contralateral side) in combination with physical or occupational therapy has been shown to provide a significant improvement in motor function (as measured by Fugl-Meyer and Wolf Motor Function) compared to a sham group . Further, a recent meta-analysis of randomized-controlled trials comparing different forms of tDCS shows that cathodal tDCS is a promising treatment option to improve ADL capacity in people with stroke . Compared to transcutaneous magnetic stimulation (TMS), tDCS devices are inexpensive and easier to operate. Improvement in upper limb motor function can appear after only five tDCS sessions , and there are no reports of serious adverse events when tDCS has been used in human trials for periods of less than 40 min at amplitudes of less than 4 mA . Moreover, tDCS stimulation task also seems beneficial for other impairments commonly seen in people post-stroke. Stimulation with tDCS applied for 20 sessions of 30 min over a 4-week period has been shown to decrease depression and improve quality of life in people after a stroke [17, 18]. Four tDCS sessions for 10 min applied over the primary and sensory cortex in eight patients with sensory impairments more than 10 months post-stroke enhanced tactile discriminative performance . Breathing exercises with tDCS stimulation seems to be more effective than without stimulation in patient with chronic stroke , and tDCS has shown promise in treating central post-stroke pain . Finally, preliminary research on the effect of tDCS combined with training on resting-state functional connectivity shows promise to better understand the mechanisms behind inter-subject variability regarding tDCS stimulation . Motor functional outcomes in stroke have declined at discharge from inpatient rehabilitation facilities [23, 24], likely a result of the pressures to reduce the length of stay at inpatient rehabilitation facilities as part of a changing and increasingly complex health care climate [25, 26]. Researchers, clinicians, and administrators continue to search for solutions to facilitate and post-stroke rehabilitation after discharge. Specifically, there has been considerable interest in low-cost stroke therapies than can be administered in the home with only a modest level of supervision by clinical professionals. Home telerehabilitation is a strategy in which rehabilitation in the patient’s home is guided remotely by the therapist using telecommunication technology. If patients can safely apply tDCS to themselves at home, combining telerehabilitation with tDCS would be an easy way to boost therapy without costly therapeutic face-to-face supervision. For people with multiple sclerosis, the study of Charvet et al. (2017) provided tDCS combined with cognitive training, delivered through home telerehabilitation, and demonstrated greater improvement on cognitive measures compared to those who received just the cognitive training . The authors demonstrated the feasibility of remotely supervised, at-home tDCS and established a protocol for safe and reliable delivery of tDCS for clinical studies . Some evidence shows that telerehabilitation approaches are comparable to conventional rehabilitation in improving activities of daily living and motor function for stroke survivors [29, 30], and that telemedicine for stroke is cost-effective [31, 32]. A study in 99 people with stroke receiving training using telerehabilitation (either with home exercise program or robot assisted therapy with home program) demonstrated significant improvements in quality of life and depression . A recent search of the literature suggests that to date, no studies combine tDCS with repetitive tracking training in a home telerehabilitation setting to determine whether the combination leads to improved motor rehabilitation in people with stroke. Therefore, the aim of this pilot project was to explore the safety, usability and feasibility of the combined system. For the tDCS treatment, we used a bihemispheric montage with cathodal tDCS stimulation to suppress the unaffected hemisphere in order to promote stroke recovery [34, 35, 36, 37]. For the repetitive tracking training therapy, we used a finger tracking task that targets dexterity because 70% of people post-stroke are unable to use their hand with full effectiveness after stroke . Safety was assessed by noting any decline of 2 points or more in the cognitive testing that persists over more than 3 days. We expect day to day variations of 1 digit. Motor decline is defined by a decline of 6 blocks on the Box and Block test due to muscle weakness. This is based on the minimal detectable change (5.5 blocks/min) . The standard error of measurement is at least 2 blocks for the paretic and stronger side. We expect possible variations in muscle tone that could influence the scoring of the test. Usability was assessed through a questionnaire and by observing whether the participant, under remote supervision, could don the apparatus and complete the therapy sessions. Our intent was to set the stage for a future clinical trial to determine the efficacy of this approach. Participants were recruited from a database of people with chronic stroke who had volunteered for previous post-stroke motor therapy research studies at the University of Minnesota. Inclusion criteria were: at least 6 months post-stroke; at least 10 degrees of active flexion and extension motion at the index finger; awareness of tactile sensation on the scalp; and a score of greater than or equal to 24 (normal cognition) on the Mini-Mental State Examination (MMSE) to be cognitively able to understand instructions to don and use the devices . We excluded those who had a seizure within past 2 years, carried implanted medical devices incompatible with tDCS, were pregnant, had non-dental metal in the head or were not able to understand instructions on how to don and use the devices. The study was approved by the University of Minnesota IRB and all enrolled participants consented to be in the study. tDCS was applied using the StarStim Home Research Kit (NeuroElectrics, Barcelona, Spain). The StarStim system consists of a Neoprene head cap with marked positions for electrode placement, a wireless cap-mounted stimulator and a laptop control computer. Saline-soaked, 5 cm diameter sponge electrodes were used. For electrode placement, we followed a bihemispheric montage  involving cathodal stimulation on the unaffected hemisphere with the anode positioned at C3 and the cathode at C4 for participants with left hemisphere stroke, and vice versa for participants with right hemisphere stroke. Stimulation protocols were set by the investigator on a web-based application that communicated with the tDCS control computer. A remote access application (TeamViewer) was also installed on the control computer, as was a video conferencing application (Skype). The repetitive finger tracking training system was a copy of what we used in our previous stroke studies [7, 8, 9]. The apparatus included an angle sensor mounted to a lightweight brace and aligned with the metacarpophalangeal (MCP) joint of the index finger, a sensor signal conditioning circuit, and a target tracking application loaded on a table computer. Figure 1 shows a participant using the apparatus during a treatment session. effectiveness of training with the UR-System-PARKO for recovery of motor function as defined by finger extension in the severe plegic hand. suggests that a method is needed for treatment of these severely affected cases. strength of the plegic extremities in patients with stroke-induced hemiplegia . extend. Thus, the first author developed a method to build up the extensor digitorum muscle strength using PNF [7, 8] for stroke patients with severe hemiplegia. on stroke patients with a severe plegic hand to help them recover their motor function, and a good treatment outcome was achieved [9, 10] (Figure 1). the tips of the fully extended hemiplegic fingers to increase the force of the extensor digitorum muscle. However, this approach is time-consuming for the therapist. Action observation (AO) is a physical rehabilitation approach that facilitates the occurrence of neural plasticity through the activation of the mirror-neural system, promoting motor recovery in people with stroke. To assess whether action observation enhances motor function and upper limb motor performance and cortical activation in people with stroke. We searched the Cochrane Stroke Group Trials Register (last searched 4 September 2017), the Central Register of Controlled Trials (24 October 2017), MEDLINE (1946 to 24 October 2017), Embase (1974 to 24 October 2017) and five additional databases. We also searched trial registries and reference lists. Randomized controlled trials (RCTs) of AO, alone or associated with physical practice in adults after stroke. The primary outcome was upper limb motor function. Secondary outcomes included dependence on activities of daily living (ADL), motor performance, cortical activation, quality of life, and adverse effects. Two review authors independently selected trials according to the pre-defined inclusion criteria, extracted data, assessed risk of bias, and applied the GRADE approach to assess the quality of the evidence. The reviews authors contacted trial authors for clarification and missing information. We included 12 trials involving 478 individuals. A number of trials showed a high risk of bias and others an unclear risk of bias due to poor reporting. The quality of the evidence was ‘low’ for most of the outcomes and ‘moderate’ for hand function, according to the GRADE system. In most of the studies, AO was followed by some form of physical activity. the impact of AO on arm function showed a small significant effect (standardized mean difference (SMD) 0.36, 95% CI 0.13 to 0.60; 8 studies; 314 participants; low-quality evidence); and a large significant effect (mean difference (MD) 2.90, 95% CI 1.13 to 4.66; 3 studies; 132 participants; moderate-quality evidence) on hand function. there was a large significant effect for ADL outcome (SMD 0.86, 95% CI 0.11 to 1.61; 4 studies, 226 participants; low-quality evidence). We were unable to pool other secondary outcomes to extract the evidence. Only two studies reported adverse effects without significant adverse AO events. We found evidence that AO is beneficial in improving upper limb motor function and dependence in activities of daily living (ADL) in people with stroke, when compared with any control group; however, we considered the quality of the evidence to be low. We considered the effect of AO on hand function to be large, but it does not appear to be clinically relevant, although we considered the quality of the evidence as moderate. As such, our confidence in the effect estimate is limited because it will likely change with future research. Mirror therapy is less commonly used to target the lower extremity after stroke to improve outcomes but is simple to perform. This review and meta-analysis aimed to evaluate the efficacy of lower extremity mirror therapy in improving balance, gait, and motor function for individuals with stroke. PubMed, Cochrane Central Register of Controlled Trials, MEDLINE, Embase, Cumulative Index to Nursing and Allied Health Literature, Physiotherapy Evidence Database, and PsychINFO were searched from inception to May 2018 for randomized controlled trials (RCTs) comparing lower extremity mirror therapy to a control intervention for people with stroke. Pooled effects were determined by separate meta-analyses of gait speed, mobility, balance, and motor recovery. Seventeen RCTs involving 633 participants were included. Thirteen studies reported a significant between-group difference favoring mirror therapy in at least one lower extremity outcome. In a meta-analysis of 6 trials that reported change in gait speed, a large beneficial effect was observed following mirror therapy training (standardized mean differences [SMD] = 1.04 [95% confidence interval [CI] = .43, 1.66], I2 = 73%, and P < .001). Lower extremity mirror therapy also had a positive effect on mobility (5 studies, SMD = .46 [95% CI = .01, .90], I2 = 43%, and P = .05) and motor recovery (7 studies, SMD = .47 [95% CI = .21, .74], I2 = 0%, and P < .001). A significant pooled effect was not found for balance capacity. Mirror therapy for the lower extremity has a large effect for gait speed improvement. This review also found a small positive effect of mirror therapy for mobility and lower extremity motor recovery after stroke.